Bach Society Houston Director Rick Erickson conducting. Photo courtesy of Bach Society Houston. Rick Erickson, director of Bach Society Houston (BSH), has had a lifelong love affair with Bach. 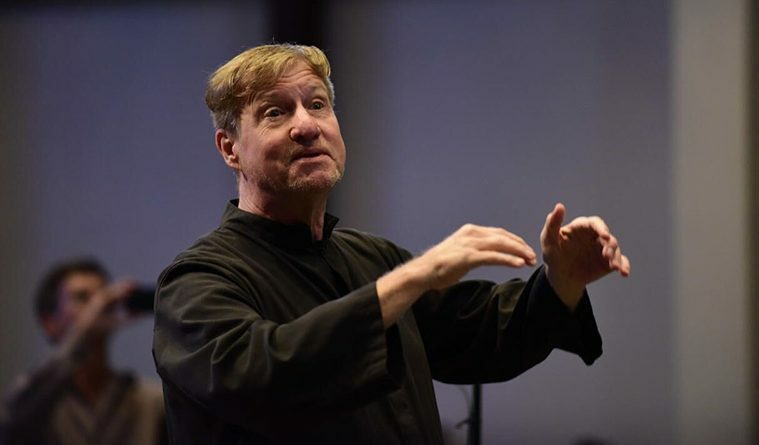 For 22 years he was Cantor of Manhattan’s Holy Trinity Lutheran Church and director of its acclaimed Bach Vespers series, upon which the Bach Society of Houston was founded in 1982. A typical BSH season includes many different types of concerts—Vespers events featuring Bach’s cantatas in a liturgical setting, special concerts exploring the wide variety of Bach’s works, chamber music concerts featuring distinguished soloists and smaller ensembles, an all-day Bach Marathon event (March 18), and organ concerts on the home parish’s remarkable “Bach Organ,” hailed as one of the most significant Baroque-inspired instruments in North America. Especially designed to carry contrapuntal music with clarity, beautifully voiced, and distinctive in its “unequal” temperament, the “Bach Organ,” built in 1995 by Fritz Noack in the style of 18th-century Saxon master organ builder Zacharias Hildebrandt, continues to draw the world’s leading organists to Houston. Acclaimed Norwegian organist Sigurd Ǿgaard, a fan favorite of the Houston audience, will return on Feb. 4 to present works by Bach, Buxtehude, and unfamiliar Norwegian composers. William Porter, who teaches at the prestigious Eastman School of Music, is known as one of the greatest improvisers in the Baroque style. He will put his genius on display on April 15. Erickson himself will be joined by Music Associate Brian Glikes of Christ the King in a New Year’s Day concert featuring rarely heard organ music for four-hands. Members of Bach Choir singing at Christ the King Lutheran Church. After co-presenting preeminent cornettist Bruce Dickey with Houston Early Music in September, the BSH chamber music series is poised to showcase a plethora of harpsichords when guest harpsichordists Mario Aschauer and Michael David Ging join Erickson, Glikes, and the Bach Orchestra to perform the composer’s spectacular concerti for two, three, and four harpsichords on Jan. 26. And another special treat awaits Bach enthusiasts when BSH teams up with Guitar Houston to present British lutenist Nigel North in a concert of Bach’s elusive masterpieces for solo lute (March 9). Soon after Harvey hit, Erickson was faced with the challenge of performing the monumental Bach B Minor Mass at the Hobby Center. Several musicians were personally affected by the floods, rehearsal times were forced to be truncated, the library and one of the harpsichords had to be rescued, and guest artists from out of town had to be reassured. But the show went on. Just as the B Minor Mass is a powerful personal will and testament for Bach, the Bach Orchestra and Bach Choir of BSH made a statement that it was of utmost importance to celebrate our city with the majesty and universal spirit of Bach’s music during the most devastating times for Houston. Upcoming special concerts will include Esther and Jonah (Feb. 16), presented in collaboration with Ars Lyrica as part of the 2018 Houston Early Music Festival. Of particular interest is Jamaican-born English composer Samuel Felsted’s Jonah, known as the first oratorio from the New World. “The break-out moment,” Erickson points out with delight, “is that God is in a woman’s voice.” Groundbreaking indeed! 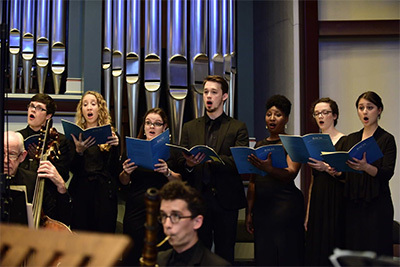 The genesis of the Bach Society evolved from the desire to present Bach’s cantatas in the context of Vespers services throughout the liturgical year. This year the joyous Bach Magnificat will usher in Advent and the Christmas season. Palm Sunday and Good Friday will be marked by Barthold Heinrich Brockes’ poetic setting of the Passion story as realized by Handel. Interestingly, Bach himself copied out of Brockes’ manuscript, but most likely for theological reasons, was never permitted to use it. The season will conclude with the full Bach Choir and Bach Orchestra celebrating Easter Sunday with the gloriously festive Bach cantata Bringet dem Herrn Ehre seines Namens (Bring to the Lord the Honor Due His Name). 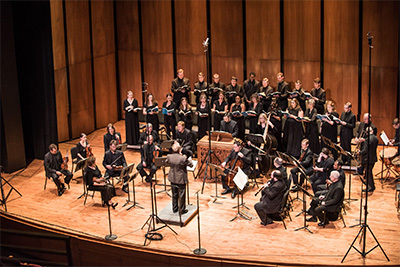 Bach Society Houston performing Bach’s Mass in B minor at Zilkha Hall in September, 2017. Photo by Kevin McGowan. 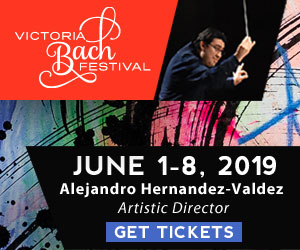 Erickson is energized by the professionalism of the Bach Society musicians. 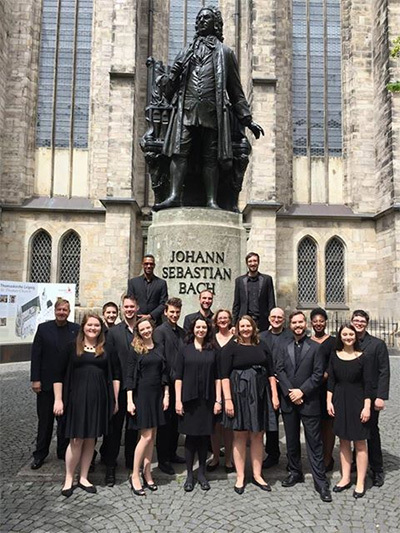 “We have a tremendous body of singers and string players.” This past summer the Bach Choir became the first professional American choir to be invited to the Leipzig Bach Festival. They performed at a dozen events in 10 days, including a service at Bach’s home parish, the historic Thomaskirche, where he worked as Cantor and Music Director for 27 years. There is a vast amount of scholarly research on Bach’s music and an abundance of critically acclaimed recordings to study. But when I sat down to listen to the 16-member Bach Choir perform his complete motets last Sunday (Nov. 5) at Christ the King Lutheran Church, I was able to put all that intellectual baggage behind. 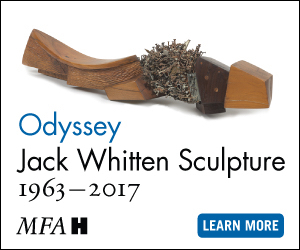 I marveled at the freshness and varied moods in these works—dramatic structural shifts from intricate fugues to gorgeously contoured arias, rich vocal colors paired with transparent textures, intimately poignant to overtly joyful expression. Voices blended in perfect balance to produce moments of sublime beauty, intense yearning, and euphoric ecstasy. This Bach, in this acoustically ideal setting, sung with all the devotion to details of phrasing and articulation, was also earthy and human and alive and communicative—just the way Rick Erickson and the Bach Society like it.